Painting My Country Utopia group spans three generations of artists from the Aboriginal community Utopia. 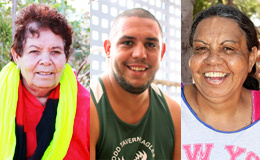 Barbara, Teresa and Jarrod all come from Utopia, which lies 250 kilo metres north-east of Alice Springs, Central Australia. The natural environment and dreamtime stories of Utopia are depicted in the artworks using acrylic paints and traditional methods.